Cauliflower cheese is an essential side dish for Sunday lunch, a delicious filling for a baked potato, and sometimes, even encased in pastry as a pasty or quiche. 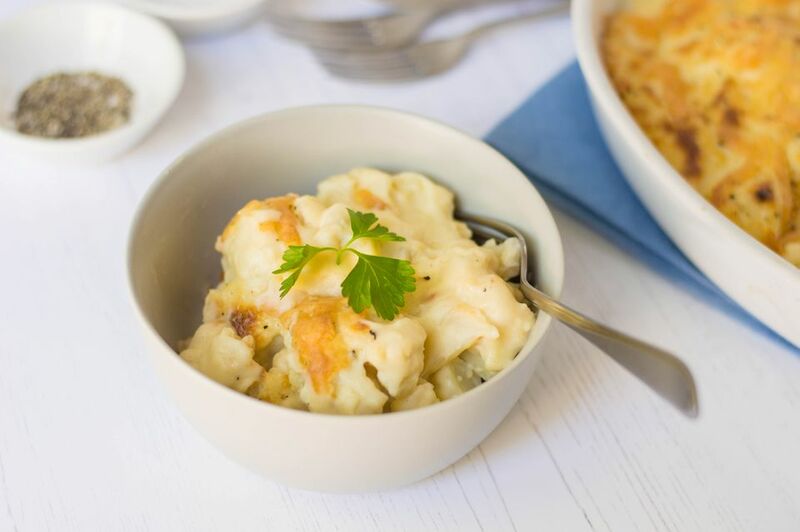 This creamy, cauliflower cheese is easy to make and a versatile dish which appears throughout British food in various guises. Cauliflower cheese makes the most of great British cauliflowers, which are not only cheap and nutritious, but are so versatile in recipes and can be steamed, boiled, baked and roasted, with each method creating its own ​flavors. Heat the oven to 395 F/200 C/Gas 7. Remove the green outer leaves from the cauliflower, cut a deep cross in the bottom of the stem, and steam whole over a pan of boiling water for 10 minutes. Remove the cauliflower from the heat and leave to cool. The cauliflower should not be cooked thoroughly, just lightly steamed so it is beginning to soften. Place the butter and flour into a large saucepan. Over a low heat stir the butter and flour until the butter has melted and the flour is incorporated. Add the salt and mustard powder (if using) and continue stirring for two minutes. This is to cook out the floury taste and to soften the starch grains in the flour ready to make the sauce. Turn the heat up to medium and add the milk in one go. Whisk furiously until a smooth sauce is formed. Continue stirring until the sauce is thickened and glossy, about 5 minutes. If the sauce is very thick, add a little more milk; the sauce should be thick but still a little on the runny side. Add the grated cheese and stir until melted. Remove from the heat. Break the cauliflower florets from the thick, central stalk, taking care not to break it into tiny pieces. Place the florets in a greased baking dish large enough to hold all the florets in one layer. Pour the thickened cheese sauce over the cauliflower, ensuring all the florets are covered. Sprinkle with grated cheese and a good twist of black pepper. Bake in the hot oven until the sauce is bubbling and golden brown on the top, approximately 30 minutes. Enjoy on its own or as a side! While cauliflower can be grown, harvested, and sold year-round, it's best in the fall, winter, and early spring. Look for white or cream-colored heads that feel heavy for their size. The deeply ribbed green leaves that envelop a head of cauliflower should look fresh, not wilted or yellowing or dry.